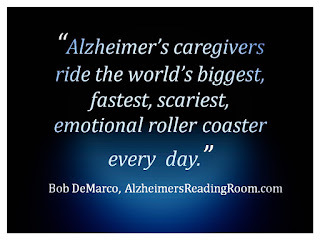 I conducted two polls here on the Alzheimer's Reading Room and both times more than 68 percent of Alzheimer's and dementia related caregivers responded they felt frustrated when those living with dementia constantly said No, and refused to cooperate. The inverse of this is of course getting an Alzheimer's patient to say Yes, or to cooperate willingly. "you know Bobby when I say NO that doesn't mean anything, its just the easiest thing to say". What Alzheimer's patients say and do can often be enlightening - if you listen. In this case, Dotty inspired me to come up with a workable solution to the word No in Alzheimer's World. I actually accomplished this Mission by talking less and by using nonverbal communication. Every time I walked by Dotty at home I would stick out my hand and wait for her to stick out her hand and touch mine. Once we made eye contact and as we were touching hands I smiled. I perfected this method with a slight change. When Dotty would reach out to hold my hand I would slide my hand down until the pads of our fingers were touching. The pads are on the very ends of your fingers. If you do this I think you will be amazed at the connection you can make with another person, and this is not limited to dementia patients. Just touch finger pads, and move your fingers around while holding on, pad to pad. With my new inspiration in my head, and after a couple of short trips to the Bunkhouse I was ready to go. Instead of asking Dotty to do something, or even saying a word for that matter, I would go up to Dotty, get the finger pads attached, make eye contact, smile, and get my smile back from Dotty. I then I would say, let's go. Dotty would usually ask where are we going? Sometimes I would say nothing, sometimes I would say to have fun. I always said as few words as possible, just a few, as I took Dotty's hand and helped her up. From that point on I just guided her. Guided her in the direction we needed to go. Let's say I wanted Dotty to take a pee. As we neared the bathroom area I would say, let's take a pee. I continued, we will take a pee and then we will have lunch (or whatever hook I needed to use). Notice the use of the word "We". No cajoling, no begging, no long and repeated explanation, no argument - just guidance. No matter what Dotty said, I would just lead her up to the door of the bathroom and in she would go and take a pee. I really didn't say much. I learned to act as her guide and not as her boss. Persons living with dementia are not children. Alzheimer's patients don't like to be bossed around, and neither do I. Instead of using my mouth, I used my fingers to do my talking. Of course I worked in the smile to make the connection - tight and effective. No more arguments, no more begging, no more feelings of complete and total exasperation. Ever feel exasperated with your dementia patient? For the method I am describing to work -- you have to slow down, and establish the nonverbal connection. You will want to make this finger connection and smile connection as many times a day as is possible. Even when you are not going to ask the person living with dementia to do something - just connect. Pretty soon you will become the guiding force, instead of Darth Vader. The level of angst and frustration will diminish across every thing you do. You will experience the Joy that comes with accomplishment, and the Joy that comes with effective understanding of persons living with Alzheimer's. You will no longer be the enemy and neither will your loved one. Keep in mind effective communication with a person living with dementia is built over time. Think of each act of guidance, understanding, and touching as a building block to the future.